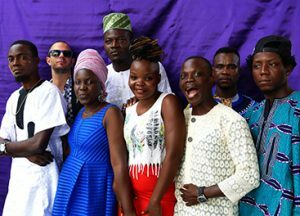 Associating voodoo rhythms and traditional songs, electronic melodies in piquant Beninese style with trip pop grooves, hip hop and rock, this collective of Beninese artists has all it takes to make us travel. Initiated by Hervé Riesen and produced by Jérôme Ettinger, BIM is a project of Radio France in partnership with ORTB, the EBU, Rolling Stone Magazine and TV5 Monde. Sponsored by the City of Nantes, Institut Français Paris and Institut Français in Benin.